Heartwood Creations by Mike Fisher - The Urban Craftsman 3 Drawer Jewelry Box is skillfully crafted from Sapele (a West African Mahogany) with a Madrone Burl top. 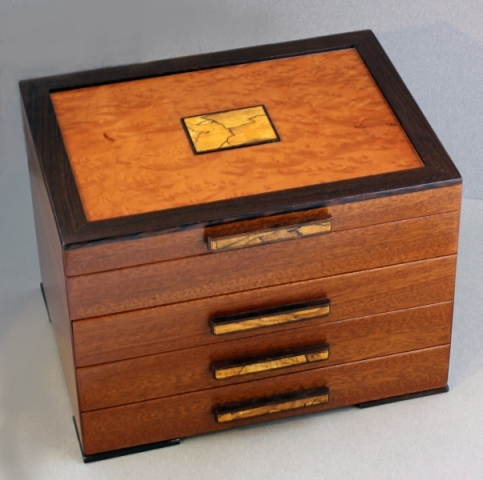 The box top is embellished with a decorative inlay featuring Spalted Maple trimmed with Wenge. Pearl-Colored Interior and jewelry Inserts are standard. Size is 9" high x 12" wide x 9" deep. The Arts & Crafts movement forever transformed concepts about 20th Century Design. 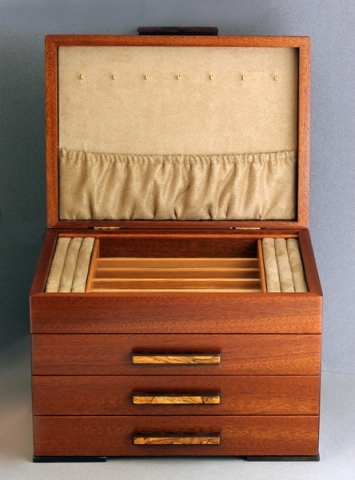 Crafted with care from the finest Sapele with Spalted Maple accents, this timeless style is the inspiration behind the Urban Craftsman Jewelry Box. Items in stock are available for immediate delivery.